Jay Cutler is a retired American football quarterback who had a 12 season-long professional career in the National Football League. After playing college football at Vanderbilt University, Cutler was drafted 11th overall in the 2006 NFL Draft by the Denver Broncos. He played 3 seasons with the Broncos before joining the Chicago Bears in 2009 for the longest stint of his career. The veteran quarterback announced his retirement after the 2016 NFL season, however, he came out of retirement in August 2017 to play for the Miami Dolphins in the 2017 season. Jay Christopher Cutler was born on April 29, 1983, in Santa Claus, Indiana. He schooled at Heritage Hills High School in Lincoln City, Indiana. Jay played both safety and quarterback positions during his stint with the school’s football team, the Patriots. The highlight of his high school career came in his senior year during which he helped the school go 15-0 overall and also clinch the 3A state championship, the first in the school’s history. His brilliant performance earned him first-team All-State selection. Cutler started in all 45 games during his 4-year college career and he did not miss any game due to injury. As a freshman, he rushed for 393 yards, the highest among all quarterbacks in the Southeastern Conference and also set a school record for touchdowns (9) and rushing yards by a freshman. His performance earned him a first-team freshman All-SEC selection. He continued in top form throughout the duration of his career with his performance eventually peaking during his senior season (2005). He completed 273 passes for 3,073 yards, 21 touchdowns, and 9 interceptions, becoming only the second player in the history of the Vanderbilt Commodores to throw for more than 3,000 yards in a single season. He finished the season with a school-record and conference-leading 3,288 yards of total offense. His performance earned him a first-team All-SEC selection and he was also named the 2005 SEC Offensive Player of the Year. By the end of his 4-year career with the Vanderbilt Commodores, Jay Cutler had set school career records for total offense (9,953 yards), touchdown passes (59), passing yards (8,697), completed passes (710), attempted passes (1,242) and combined touchdowns (76). Entering the 2006 NFL Draft, he was ranked third among all the quarterback prospects and was drafted in the first round by the Denver Broncos with the 11th pick. 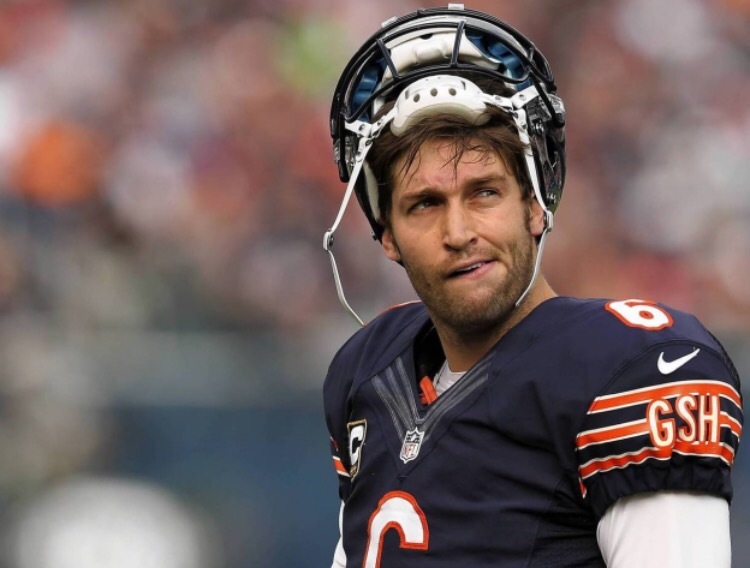 As a rookie, Jay Cutler began the 2006 NFL season as the second quarterback on the Denver Bronco’s depth chart but was ultimately announced as the team’s starting quarterback midway through the season. He featured in a total of 5 games and finished with a 2-3 record, completed 81-of-137 passes for 1,001 yards while attaining 9 touchdowns and 5 interceptions. The 2007 NFL season marked Cutler’s first full season as the Bronco’s starting quarterback. He started in all 16 appearances for the season and he went 297-of-467 (63.6%) for 3,497 yards, 20 touchdowns, and 14 interceptions. He equally recorded 44 rushes for 205 yards (4.7 yards per carry) and a touchdown. The talented player upped his performance in the 2008 season finishing with career-best records in passing completions (384), passing attempts (616), passing yards (4,526), passing touchdowns (25), interceptions (18), rushing attempts (57) and rushing touchdowns (2). He had eight 300-yard passing games for the season, the best in team history and he also set the Broncos’ single-season record in passing yards, completions, and attempts. He was named for the 2009 Pro Bowl, the only Pro Bowl selection of his career. Jay Cutler was traded to the Chicago Bears in April 2009. In his first season with the Bears, the NFL star finished with a passer rating of 76.8 for 3,666 yards and he also recorded 27 touchdowns and a league-leading 26 interceptions. He put up a similar performance in 2010 as he finished with 3,274 passing yards, 23 touchdowns, 16 interceptions, and 232 rushing yards. However, he was limited to only 10 games during the 2011 season owing to injury and for the season, he had 2,319 passing yards, 13 touchdowns, and 7 interceptions. For the 2012 season, Cutler recorded an 81.3 passer rating for 3,033 yards, 19 touchdowns and 14 interceptions in 15 games. He became the Chicago Bears all-time leader in passer rating (81.9) and completions (1,034). His 2013 season was marred by an injury as a result of which he played only 11 games finishing with 224-of-355 for 2,621 yards, 19 touchdowns, 12 interceptions, and a career-best 89.2 passer rating. For the 2014 season, he completed 370-of-561 passes for 3,812 yards, with a career-high 28 touchdowns and a league-leading 18 interceptions. Jay Cutler had one of the best seasons of his career in 2015 as he accrued 3,629 passing yards, 21 touchdowns, 11 interceptions, and career-bests in passer rating (92.3) and completion percentage (64.4). He was, however, plagued by injuries in 2016 season which turned out to be his last season with the Chicago Bears. In 5 appearances, he recorded 1,059 passing yards, 4 touchdowns, 5 interceptions, and a 78.1 passer rating. He was released by the team in March 2017 and 2 months later, he announced his retirement from the sport. Coming out of retirement in August 2017, Cutler joined the Miami Dolphins after the team’s quarterback Ryan Tannehill incurred a season-ending injury. He played 14 games with the Dolphins in the 2017 season and he finished with 2,666 passing yards, 19 touchdowns, and 14 interceptions. Jay Cutler had an illustrious professional career which spanned over a decade and is unarguably one of the best quarterbacks in the history of the NFL. He has an estimated net worth of $50 million, a great chunk of which he amassed via career earnings. Cutler’s last NFL contract was his $10 million one year deal with the Miami Dolphins with a base salary of $5,000,000 for the 2017 season. Jay Cutler’s wife is none other but the reality TV star, fashion designer and actress Kristen Cavallari. The duo got together in the fall of 2010 and less than a year later, they got engaged. They called off their engagement after a while, reconciled in late 2011 and eventually tied the knot on June 7, 2013, in Nashville, Tennessee. This famous couple has welcomed 3 children so far. Their son Camden Jack was born in August 2012 and their daughters Jaxon Wyatt and Saylor James were born in May 2014 and November 2015 respectively.